Trivandrum or Thiruvananthapuram is an old city located on the west coast of the state of Kerala. This grand city is the capital as well as the largest urban metropolis of Kerala. In Trivandrum, we started with Mani Mess, a vegetarian restaurant in Manakkadu, near Sreevaraham temple. 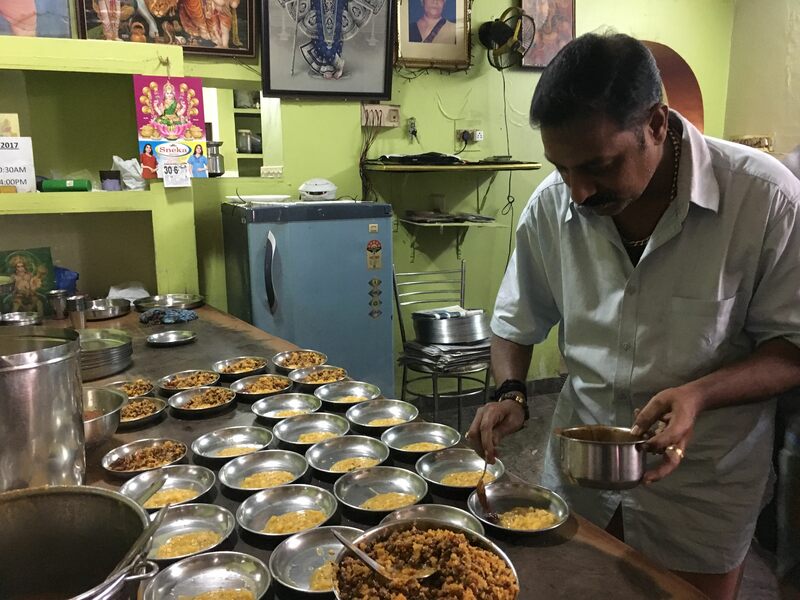 Since its inception, 37 years ago, this restaurant is run by Krishnamoorthy and his sister Thankam. As you enter the restaurant, there is a waiting area lined up with chairs for seating. Tokens are issued and the guests are asked to sit and wait for their table. The popularity of the restaurant can be gauged from the fact that the customers are generally asked, albeit politely, to finish their meals in fifteen minutes. 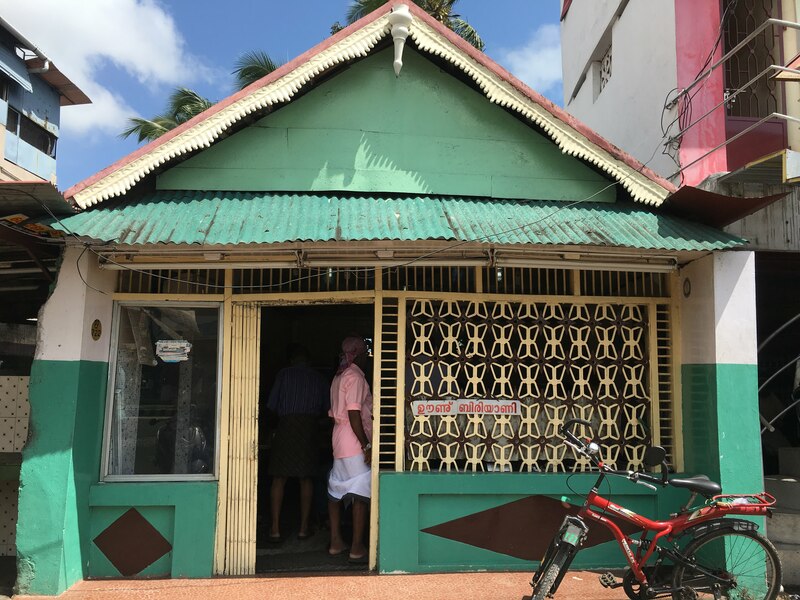 Just like all other places in Kerala, this too is adorned with a sign outside saying ‘Meals Ready’ (or in some cases ‘Biryani Ready’, which is promptly removed the moment the offering gets over. 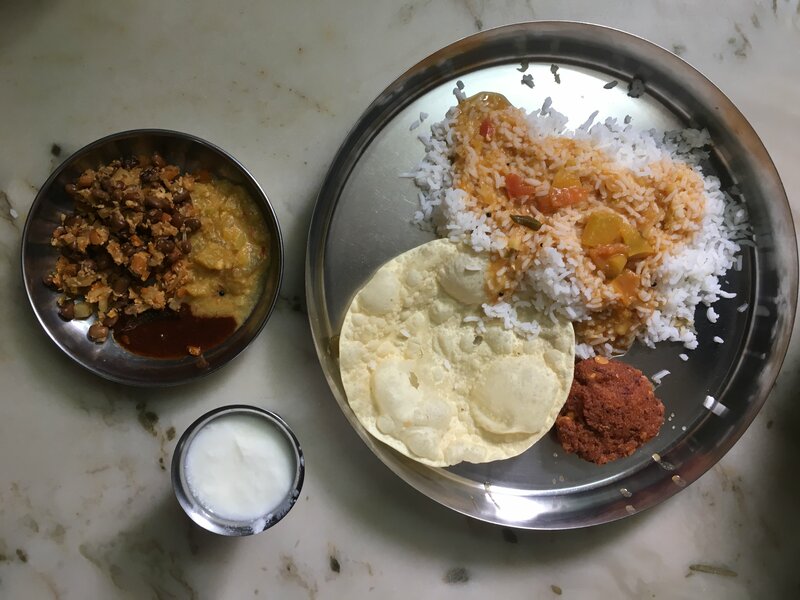 Their standard lip-smacking meal comprises of rice, Sambhar, Thoran (stir fry vegetables ), Avial (vegetables and shredded coconut), Pachadi, Achaar (pickles), Olan (pumpkin and grams cooked in a gravy of coconut milk) Rasam (soup made with tamarind, pepper and other spices), More (spiced buttermilk) , Parippuvada (lentil fritters) and Papad. The meal is served with red coloured padumugam powder and lukewarm water. The homely food along with a variety of delicacies in one plate is sure to tickle your taste buds. After a perfect start to our foodie expedition, in the state of spices-Kerala,our next stop was Kochanan Sahib’s restaurant, a peculiar place without a nameplate. Standing tall since 1964, Kochanan Sahib is located at Karamana Junction near ICICI bank’s ATM. 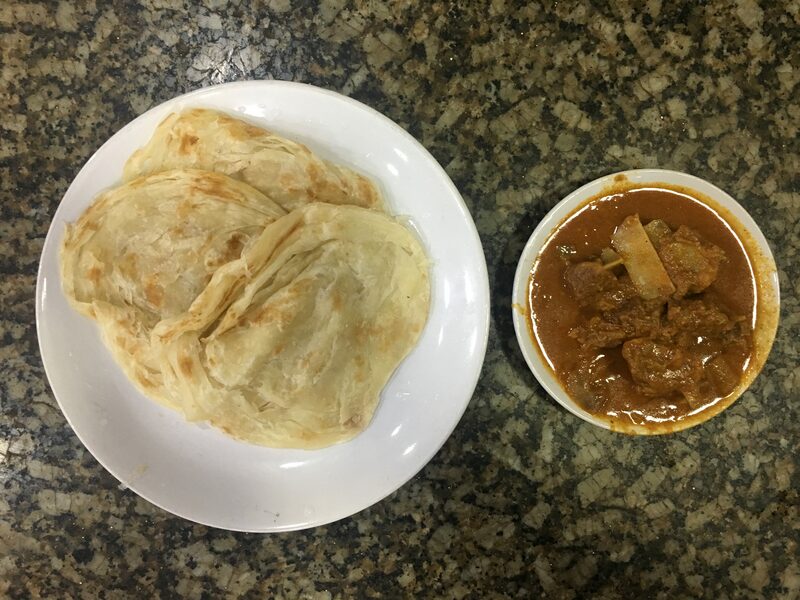 This place serves the best mutton curry, mutton roast and mutton biryani in Trivandrum. The mutton roast was cooked in thick gravy to be eaten with Parottas. 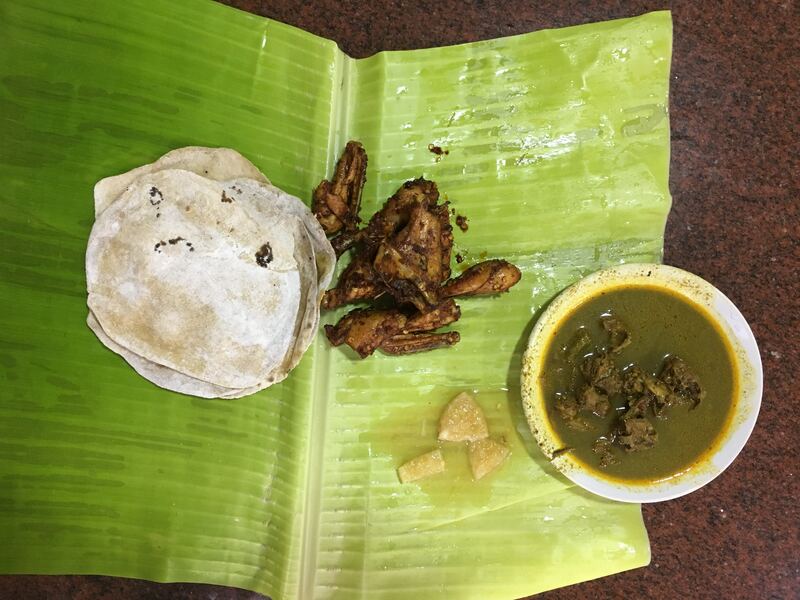 The meals are served on the traditional banana leaf. Alongside is the typical Kerala accompaniments with the Biryani, onion Raita and lemon pickles. For evening tea, we went to a popular tea shop nearby, Chaithanya Tea Shop, located in Sasthamangalam. This little tea-snack shop has a large variety of delicacies to die for- cakes, Pazham Puri, Bhaji and many others. We had a cup of tea with banana fry commonly known as Pazham Puri. Horlicks and Bournvita have also gained immense popularity as a beverage here, and in all of Kerala. Zam Zam restaurant, opposite MLA hostel in Palayam was our quick stop for Al Faham (Arabian grilled chicken) and Shawaya (whole grilled chicken). As you head forward, Buhari hotel in Attakulhangara is another renowned food joint known for their mutton chops, mutton roast and mutton brain roast. The restaurant was started in 1956 and caters to its customers till midnight. The chops were cooked in thick gravy with lightly flavored spices and served with crispy parottas. Buhari Hotel also runs a delicious juice and shakes parlour, which has turned out to be a popular hangout place for youngsters. One can relish khammam and Sharjah milk shakes here. The tender coconut malai is crushed in coconut water and mixed with dry fruits- almond, figs, cashews with frozen milk to give it a thick consistency, making it an immensely refreshing drink. 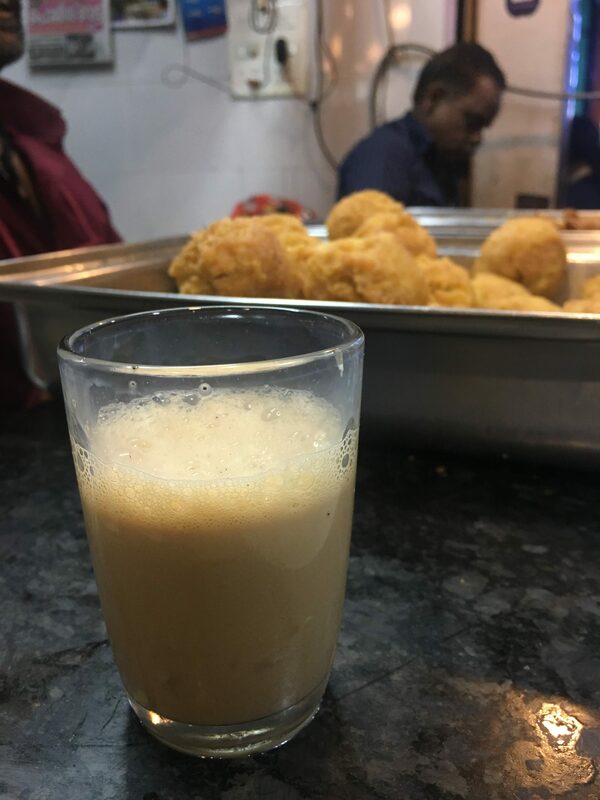 Another popular joint for shakes is Chithra shakes near Law college junction. Their herbal drinks are a must-try! The hotel manager guided us to a local eatery named Hotel Krishna, a bit far away from the main city at Kattachalkuzhi in Balarampuram, close to Coconut Research Centre. The restaurant started by Krishan Kutty, 22 years back is now managed by his son Shahji. The place is known for its Chicken Perattu and Chicken Thoran. 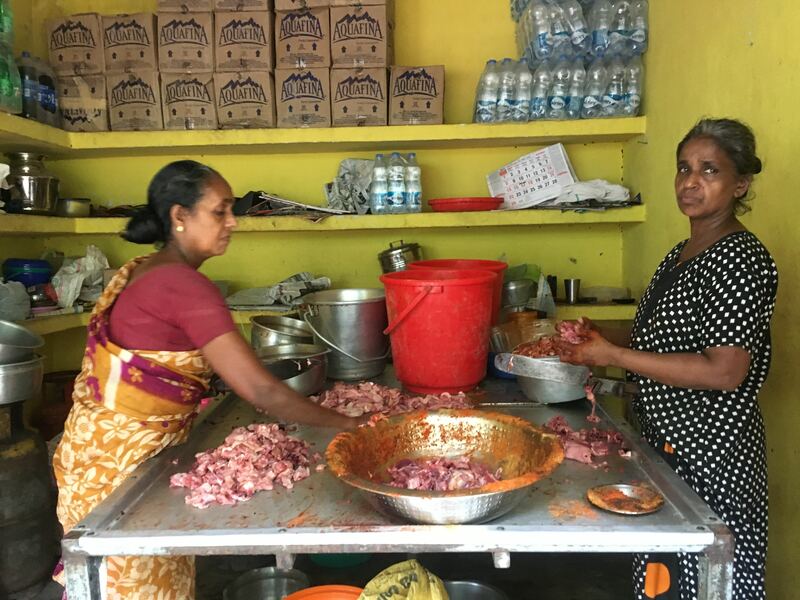 As you enter the shop, you notice a group of ladies cutting and chopping ‘Nadan’ chicken; which is equivalent to desi or country chicken. It is further marinated in local spices. The pieces are then fried in coconut oil with local flavours and spice mixes. A dry preparation, the chicken is served with meals that has tapioca, rice or puttu. After having our fill at Hotel Krishna, we moved on to Hotel Rehmaniya (Kethel’s) in Chalai market road. The restaurant since its inception in 1949 is known for a single signature dish- fried chicken. The small sized chicken pieces are fried in coconut oil along with red chillies. The seeds of dried red chillies add a crunchy taste and texture to the chicken making it lip smackingly delicious. Fried chicken is served with Chapathi and the left over chicken pieces are converted into curry and lemon pickles. They also serve fresh lime water with the meals. The two day food-journey in Trivandrum ended at Kovalam beach with the classic beach snack- Uppil Ettath – mango and gooseberry slices in salt water and green chillies. A joyous day, indeed!